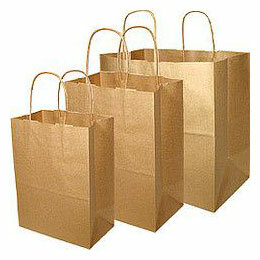 We are one of the leading Manufacturers & Exporters of Kraft Paper Bags in India. Kraft Paper Bags are environmental friendly and can be recycled. Kraft Paper Bags manufactured by us can be used repeatedly for various requirements due to its quality make and load bearing capacity. The Kraft Paper Bags are used to carry gifts, wine bottle, heavy clothes, grocery, food etc. Color : 1-4color printing or pantone color as per design.